Rue is such an unassuming little plant. Pretty, but not flashy like a Pineapple Sage or tasty like a French Tarragon or even fragrant like a Butterfly Bush. 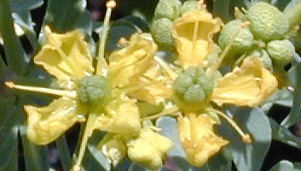 Like many Mediterranean plants, Rue has Biblical connections. But even those are not too exciting. It is mentioned only once in the Bible as an herb to be tithed. “But woe unto you, Pharisees! for ye tithe mint and rue and all manner of herbs, and pass over judgment and the love of God: these ought ye to have done, and not to leave the other undone.” Luke 11:42. Harold Moldenke, in Plants of the Bible, points out that plants that were cultivated in gardens were subject to being taxed or tithed. And, since in the Old Testament Rue is not taxed, it may be that even though it was used in the kitchen, it was cultivated from the wild. In which case, it may have been the more common African Rue or Ruta chalpensis that was being used. By Jesus's time, Rue was being cultivated and taxed; and since Ruta graveolens was not as prevalent in the wild, it is thought that this may be Rue of New Testament Gardens. 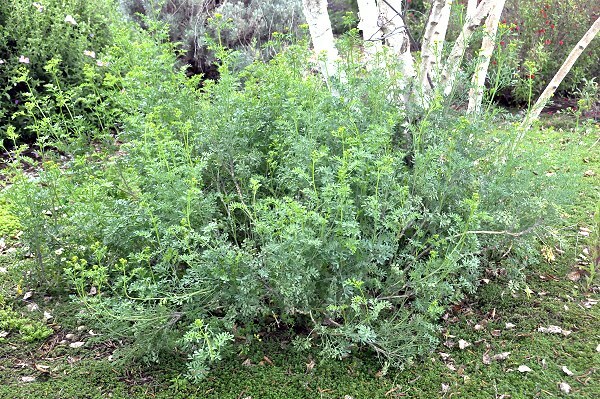 Throughout history, Rue has been used for everything from flavoring cheese to driving out evil spirits. Yet, no one use seemed to really catch on. Shakespeare called Rue the ' herb of grace' and a short time later it became associated with repentance, (rue the day) as sprigs of rue were used to sprinkle holy water in early Christian rituals. Rue is one of the ingredients used in the Vinegar of Four Thieves. The four thieves were a family of perfumers (who knew their herbs) who robbed the dead during the Black Plague. As the tale goes, they were protected by this antiseptic concoction of Vinegar and Herbs. It was probably more the antiseptic qualities of the other herbs, Rosemary, Lavender, Sage and Mint that actually gave the vinegar its punch. But, the pungent aroma of the Rue must have added that odor of truth to the mix. Indeed, the species name graveolens means strong smelling. Today, there is early research which indicates that rutin, a photochemical found in rue, may help to inhibit tumor formation on the skin and yet skin allergies due to brushing against Rue in the garden on sunny days are very common. Why sunny days? Rue is classified as a photosensitizer which means the sun is necessary for the skin to be bothered. Mature Rue Plants in front of a Paper Burch. Pink Lemonade Thyme carpets the ground underneath. 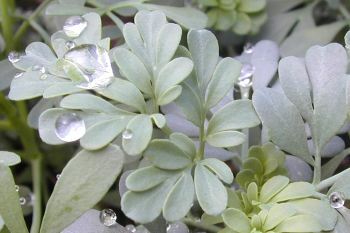 Rue's silvery gray leaves are very ornamental in the garden. Not too fussy about its growing conditions, Rue reaches about two feet when in bloom with its little yellow star-crossed flowers. So, what does Rue taste like? Kind of like a very bitter blue cheese. It is listed as an ingredient in two ancient Roman dishes, SARDA ITA FIT (Tuna) and ALITER DULCIA, a kind of dessert. Rue seeds are an ingredient in Ethiopian Jewish dish called Shiro Wat. Over the years it has been added sparingly to soups, stews and poultry dishes. It is still used in the making of an Italian brandy called Grappa. Its essential oil should never be taken internally and none of the plant should ever be consumed by pregnant women. For the most part, the closest Rue gets to being used in cooking today is as the French word for Street where a restaurant might be located (8 Rue De Beauce). Or, maybe when it is used incorrectly in cooking as in making a roux (pronounced but not spelled Rue) of flour and butter. And, while adding it to your cheese may be an acquired taste for you, it is a favorite food of several species of the Swallowtail Butterfly. Lucky for Rue, it is so pretty in the garden. Someone else thought so too, because long ago it became immortalized for all time in the suit of clubs on playing cards. This plant is often available in plug trays. These trays hold 128 of all the same plant. They are a great low cost way to fill a lot of space. Each cell is 3/4 of inch by an inch. Check here to see if Rue Plug Trays are available.